A hot day on the South West Coast Path between Axmouth and Lyme Regis. The quivering air smells warmly of bracken. Gorse pods snap sharply, flinging their seeds into the tangled undergrowth. The Chasm was created on Christmas Day 1839 when a massive section of cliff nearly a mile long subsided towards the sea, isolating a block of land known as Goat Island. Witnesses reported ‘flashes of fire and a strong smell of sulphur’. The Great Landslip became famous and drew thousands of sightseers. A pamphlet claimed it was the fulfilment of a prophecy in the Book of Revelation. Queen Victoria viewed it from the royal yacht and a piece of dance music, The Landslip Quadrille, was composed and played on the paddle steamers that plied the coast. 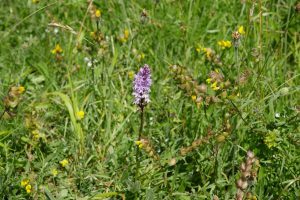 Common spotted orchid and yellow rattle. To reach Goat Island today you climb the steps out of the Chasm and emerge on a tilted tabletop of chalk grassland that slopes beguilingly towards a sheer edge. Orchids thrive here; pointy magenta hats of pyramidal orchids (Anacamptis pyramidalis) vie with the mauve, frilly dusters of common spotted orchids (Dactylorhiza fuchsii). The bee orchids (Ophrys apifera) have finished flowering and their sturdy brown stems are clustered with ridged, cylindrical, seed cases like mini marrows. At the meadow’s shaded edge, I’m lucky to find a lesser butterfly orchid (Platanthera bifolia), its fragile, greeny-white flowers frazzled by heat. It’s tempting to see Goat Island as a place marooned in time. But nearly 200 years ago, this meadow was planted with wheat and turnips. The Great Landslip destroyed its agricultural potential and set it adrift on a paradoxical new course. The ground could move again at any time, and yet for wildlife, it’s this instability that guarantees its future. 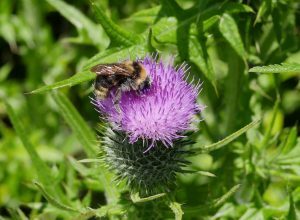 Field cuckoo bumblebee on thistle head. 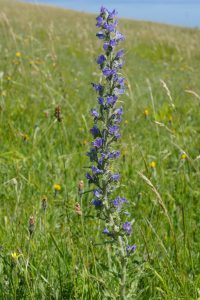 Vipers bugloss flowers in abundance at Goat Island.